Ju played as a second-half substitute in South Korea’s shocking 2-0 win over defending champions Germany in their final Group F match at the 2018 World Cup last Wednesday. The 27-year-old was one of the biggest contributors for the historic win as he created South Korea’s second goal against Germany at Kazan Arena in Kazan, Russia. With South Korea leading 1-0 in the second-half stoppage time, Ju won the ball from German goalkeeper Manuel Neuer, who left the box and even moved up to the left wing, and sent a long pass to a sprinting Son Heung-min. The Tottenham Hotspur forward then easily tapped the ball into the empty net to seal the victory for South Korea. With Neuer out of his position to help Germany score goals, some fans pointed out that Ju’s long ball was him shooting for a goal, not a pass. 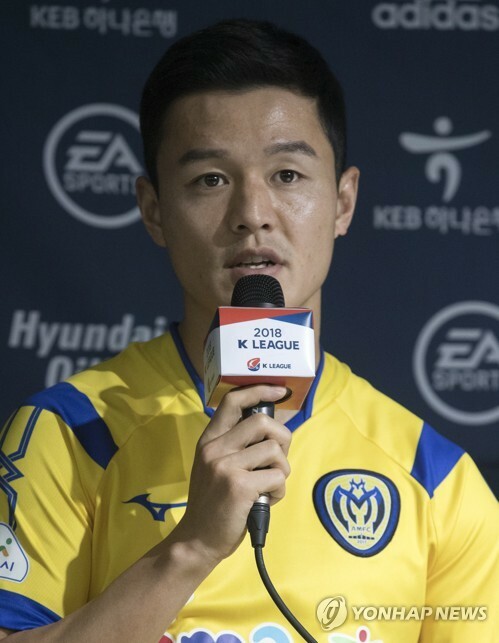 However, Ju, who is with South Korean second-tier club Asan Mugungwha FC, said it was a pass aimed at Son. Despite the win over Germany, South Korea failed to reach the round of 16 as they previously lost to Sweden 1-0 and fell to Mexico 2-1. In his first World Cup, Ju started against Mexico before playing some 25 minutes against Germany.